This is a request from just one amongst all the earthlings for an article by the Veteran if & when he is pleased, to solve the eye boggling mystery for the simple minded laymen behind the unrealistically eye candy avatars of the much favoured Cnidarian (E. quadricolor) emanating seemingly from some sorcery or discovery of some sort. 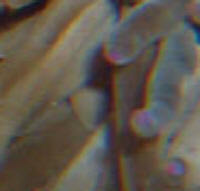 <Hey Anupam. If you're hinting that you'd like to see me/someone here on WWM pen such, it won't be me. (Again) I don't know the origin of these Entacmaea, but I fully suspect they're man-made (not natural)... Have seen comments re "Rainbow" et al. 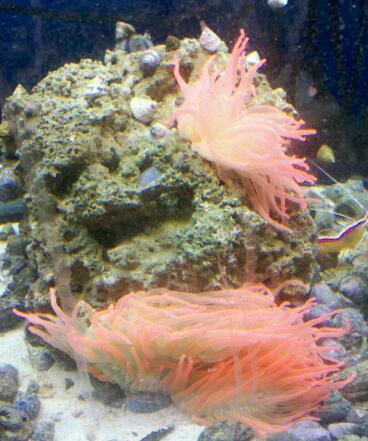 Anemones since 2007 or so... "From China?" and said if I want it I can have it for $15. I inspected the foot (intact) and the mouth (closed tightly) the color is beautiful, brown foot and tentacles, fading into a bright purple/lavender at the tips. I took it home and after looking online cannot find anything regarding "purple" bubble tips. 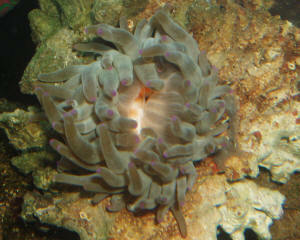 The anemone is small, maybe 3 inches across. It seems to be doing well so far, but it is a mystery. I have no idea exactly what species this is.. Can you help? Thank you so much!! 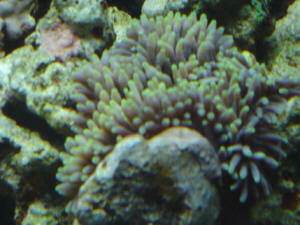 I purchased this "anemone" at my lfs. 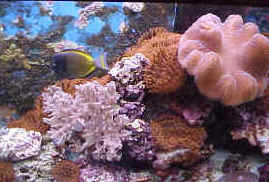 I was told out is a bubble tip anemone. 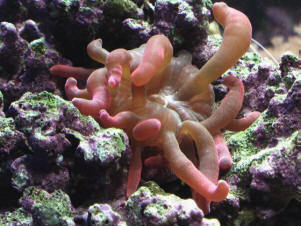 However I have not been able to find a bta that looks anything like this. Can you tell me if this is the case? Thanks bob. You say it could be however I guess my concern was did I receive what I was told the specimen was? 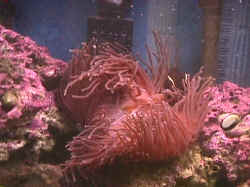 I was worried out could be a majano our other nuisance anemone. My LFS has this specimen in stock. 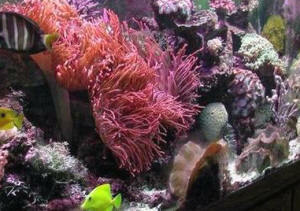 It looks like two different anemones, but it is one large one. 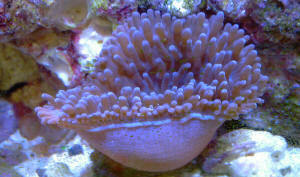 The owner said it is an Australian Bubble Tip Anemone and is asking for $300 for the anemone and rock. The cell phone pic isn't that good, but it is a very vibrant orange. Beautiful. 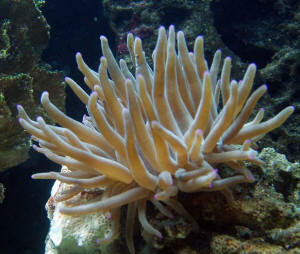 I've Googled Australian Anemone, and I haven't found anything that looks similar. Is this really an Australian Bubble Tip and is $300 reasonable for this specimen in Michigan? RBTA usually go for $80 to $160 at the stores. Would you mind taking a look at these two little beasts? 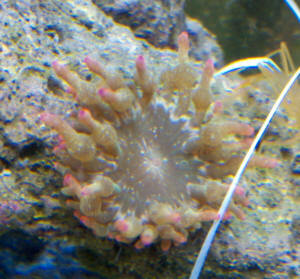 The anemone in the 2d photo was listed as a BTA, but I have suspicions that my LFS is a little loose with their IDs. I have looked in your ID section, but they all start to look alike after a few hours. What do you think? I have never seen the tips bubble up, even though it has grown steadily in the 3 months I have had it. I feed it krill (~ 1.5") soaked in Selcon, and the Maroons never leave it. Just wish I knew for certain what it was. The coral looks to me to be a Montipora variety, but it has larger polyps on it, and appears to have most of them on/near its edges. I have a beautiful purple/green M. capricornis on the other end of the tank, but it obviously does not have this polyp configuration. Can you point me in the right direction please? By the way, thanks for the recent assist with an H. rigida ID. I purchased it, and it is now looking great, eating, and (to the best of my knowledge) thriving on top of my reef stack under the 10K HQI. I ordered an RBTA last week and it finally arrived yesterday. I acclimated it slowly so I wouldn't shock it. First off, I would like to know if I actually got an E. Quadricolor. for approximately a year and a half. The return pump has been upgraded to a MJ1200 and I also have a K-Nano for flow. I have a JBJ K2 Viper 150 watt metal halide for lighting. I run a big media bag of carbon in the middle chamber that I change every two weeks and I do a ~4 gallon water change every 1-2 weeks. Is there anything else I could do to better suite <suit> the anemone? I was thinking I should hold back on target feeding for a few days until it inflated for the first time.